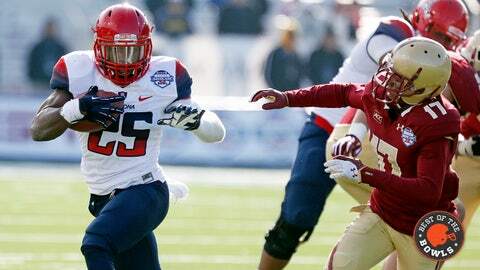 Arizona's Ka'Deem Carey was one of college football's best running backs in 2013. The AdvoCare V100 Bowl was never about the game, really, but rather two players: Arizona running back Ka’Deem Carey and Boston College running back Andre Williams. The game wasn’t much – Arizona 42, Boston College 19. The Wildcats pushed it to 21-6 at halftime, and it got only worse from there. But still, Carey and Williams. The guy who ran for 206 yards and four touchdowns in an upset over Oregon against the guy who led the nation in rushing with 2,102 yards and made it to New York City as a Heisman finalist. It was the single reason for intrigue in an early afternoon game on New Year’s Eve, and likely the final college football game for both. Williams, a senior, has no choice, and Carey, a junior, doesn’t seem to have one either. Sure, Carey could come back, but he’s regarded as one of the top running backs in the 2014 NFL Draft at a position that churns through players perhaps more than any other. In the postgame press conference – after Carey ran for 165 yards and two TDs on 28 carries (Williams had 75 yards and one TD on 26 attempts) – he was asked about his future. Ka'Deem Carey says in postgame interview he hasn't made any decision about NFL. The gaudy rushing totals of both backs – while Williams led the nation in rushing yards, Carey was sixth at 1,716 – were well-hyped entering this bowl, a call out to the audience as a reason to watch. There’s another number that, to me, is more interesting: the number of attempts that produced those yards. Williams led the nation with 355 (including bowl game) carries this season, bringing his four-year career total to 704. Carey was second with 350, which makes his three-year total 744. That’s a lot of abuse before a player even begins his NFL career. Out of curiosity, I looked at the top five running backs taken in the last three years of the NFL Draft and then tallied up their total number of college carries, just to see how Carey and Williams compared. 2013 NFL Draft: North Carolina’s Giovani Bernard (423), Michigan State’s Le’Veon Bell (671), Wisconsin’s Montee Ball (924), Alabama’s Eddie Lacy (355), Texas A&M’s Christine Michael (529). 2012 NFL Draft: Alabama’s Trent Richardson (540), Boise State’s Doug Martin (617), Virginia Tech’s David Wilson (462), Cincinnati’s Isaiah Pead (545), Oregon’s LaMichael James (771). Ball blows the field away with 924 attempts at Wisconsin, as the Badgers tied him to a treadmill and walked away for four years. James has the second-most at 771, and then Carey would slot in third with his 744. Williams, also a future pro if not quite as highly regarded as Carey, is fourth at 704. Only two others (Bell, Martin) cracked 600. There’s a huge gulf between the Carey/James/Williams trio and the average back in this sample. Does this mean Carey or Williams is at greater risk of getting injured in the NFL or not being as productive in the league? In Williams’ case, one NFL scout isn’t that concerned about the mileage, noting this is the first season he’s been ridden as heavy as he has and, "He’s a freak physcially." There’s no way to really project how the cost of the college carries will translate to a player’s NFL career, but these huge rushing totals that get players to NYC as a Heisman finalist, or earn them other awards and recognition, don’t seem worth celebrating. I thoroughly enjoyed watching Carey and Williams play one final college game, but it was impossible to watch them take a football for the 700th time as a college athlete and slam their bodies into other, sometimes bigger and stronger, bodies and not think about if any of this is any good. I’d much rather be any one of the Alabama backs, who split time with someone else just as good while in school and therefore were salvaged a bit more in the years before they could cash that running ability into financial gain. Anyway, it was a blast to watch these two backs this season. Hopefully, the hundreds of carries across college campuses still left enough fuel for long, successful professional careers.